Tumour regression/disappearance after intravenous administration of a novel tumour-targeted polypropylenimine dendrimer combined with Tumour Necrosis Factor (TNFα) expression plasmid, with complete disappearance of 90% of the tested tumours and regression of the remaining ones. These results are highly important, as there is currently no gene medicine commercially available for the intravenous treatment of cancer. This work was published in Journal of Controlled Release (JCR), made the cover and the editorial of the journal. The Editor of JCR described these results as being “highly remarkable and interesting”, concluding that “for now Dr. Dufès seems to be at the forefront of achieving such a goal” (talking about clinical trials). This work led to wide international press coverage. Tumour regression in a xenograft model after intravenous administration of transferrin-bearing gene medicine (green). (Control: untreated tumours (red)) (Koppu et al., 2010). Tumour regression/disappearance after intravenous administration of a novel tumour-targeted polypropylenimine dendrimer combined with p73 expression plasmid, with complete disappearance of 10% of the tested tumours and long-term survival of the animals. It is the first time that a tumour-targeted p73 could lead to tumour suppression after intravenous administration. This work was published in Biomaterials. Regression/disappearance of prostate tumours after intravenous administration of a novel tumour-targeted polypropylenimine dendrimer combined with either TNFα, TRAIL and IL-12 expression plasmids, with complete disappearance of up to 60% of PC-3 tumours and up to 50% of DU145 tumours. It is the first time that gene therapy was shown to be efficacious for the treatment of prostate cancer in laboratory settings. Tumour regression/disappearance after intravenous administration of a novel tumour-targeted polypropylenimine dendrimer combined with Tumour Necrosis Factor (TNFα) expression plasmid, with complete disappearance of complete suppression of 60% of A431 tumours and up to 50% of B16-F10 tumours over one month. This manuscript was published in Nanomedicine: Nanotechnology, Biology and Medicine. The Editor of this journal classified the article as of “potential clinical significance” and commented that “the positive findings in animal studies should provide the basis for further clinical studies”. Confocal microscopy imaging of the cellular uptake of fluorescently-labelled DNA either complexed with polypropylenimine dendrimer bearing arginine (left) or lysine (middle) after incubation for 24 hours with A431 epidermoid carcinoma cells (control: DNA solution (right) (Blue: Nuclei stained with DAPI, green: fluorescently-labelled DNA)(Aldawsari et al., 2011). Increase of gene expression in the brain following intravenous injection of transferrin-bearing dendriplex (at least twice higher than that of the unmodified dendriplex), while decreasing the non-specific gene expression in the lung. Gene expression was at least 3-fold higher in the brain than in any tested peripheral organs. This work was published in Journal of Controlled Release. Increase of gene expression in the brain following intravenous injection of lactoferrin-bearing dendriplex (by more than 6.4-fold compared to that of the unmodified dendriplex), while decreasing the non-specific gene expression in the lung and the kidneys. Gene expression was significantly higher in the brain than in any other tested peripheral organs. The administered gene was expressed in the hippocampus, which plays an important role in consolidating information from short-term memory into long-term memory. It is a primary site for Alzheimer's pathology, which makes gene expression in this brain area particularly interesting for future therapeutic developments. This work was published in Journal of Controlled Release. 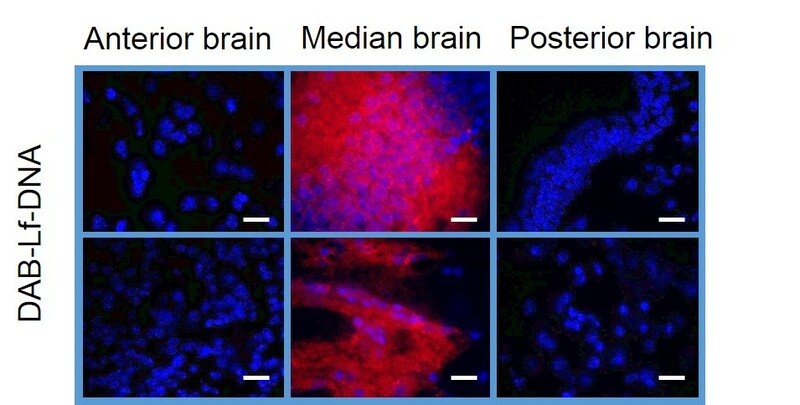 Epifluorescence microscopy imaging of the distribution of gene expression within the anterior, median and posterior brain areas after a single intravenous injection of tdTomato- encoded DNA (50 µg) either complexed with DAB-Lf or in solution (Blue: nuclei stained with DAPI, red: tdTomato expression) (Bar: 10 µm). Tumour regression/disappearance after intravenous administration of the vitamin E extract tocotrienol entrapped in novel tumour-targeted vesicles, with complete disappearance of 40% of the melanoma tumours. This work corresponds to the first preparation of a tumour-targeted delivery system able to encapsulate tocotrienol. It is the first time that a tocotrienol formulation can lead to tumour suppression. This work was the object of wide international press coverage, led to 2 publications in JCR. The last publication was mentioned in the editorial as showing “highly efficient tumoricidal activity” and “further research […] is expected to bring a new dimension to targeted drug delivery”. Tumour regression/disappearance after intravenous administration of the green tea extract epigallocatechin gallate encapsulated in novel tumour-targeted vesicles, with complete disappearance of 40% of the tumours for both tested tumour types. It is the first time that a green tea extract was shown to have an anti-cancer therapeutic effect. This publication was the object of wide international press coverage, including interviews by Fuji TV (Japanese TV) and by Allure magazine (US magazine).